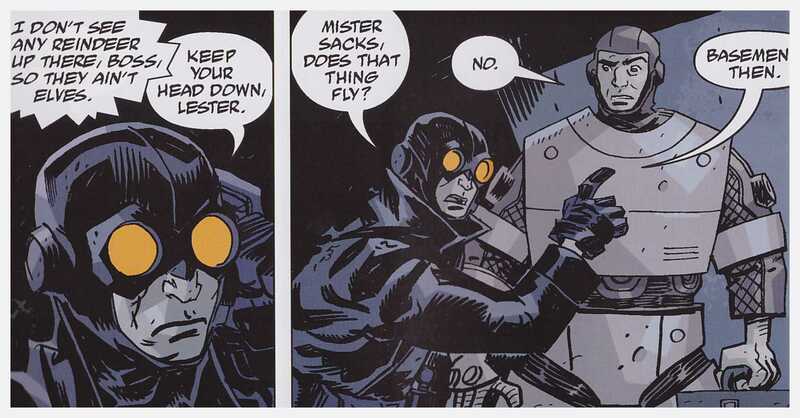 Lobster Johnson is Mike Mignloa’s version of a 1930s pulp adventurer, solving crimes with his wits and his fists with distinctive orange tinted goggles. 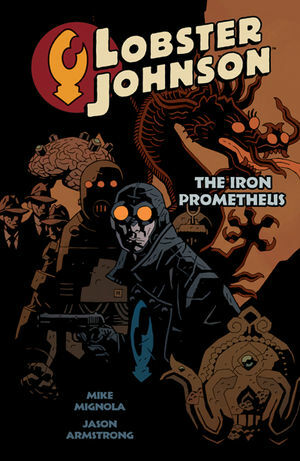 His début can be found in B.P.R.D. 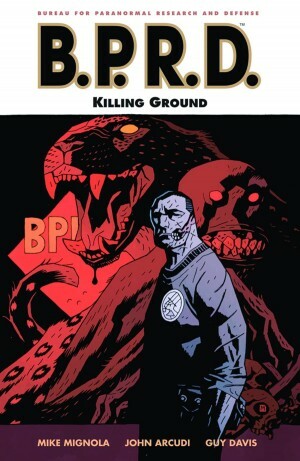 : Hollow Earth, after which he was integrated into Hellboy’s continuity with Conqueror Worm, and he mysteriously replaced Johan in present day B.P.R.D. : the Black Goddess. The Iron Prometheus is his first extended outing in his own mileu. Lobster’s name derives from the trademark lobster claw symbol he carries on the palm of his gloved hand, used to brand the foreheads of criminals. It also appears as a motif on his aviator’s leather jacket. His brand of justice doesn’t bother with the niceties of rehabilitation, and he doesn’t hesitate to kill those endangering his own life or the lives of others. 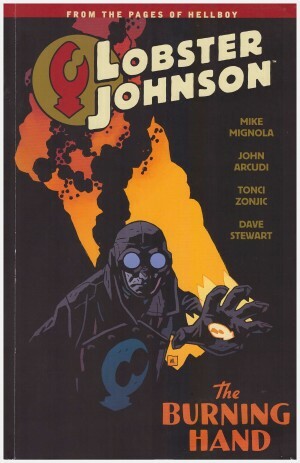 Mignola’s 1937 setting moves from New York to a very strange place indeed. The opening pages have Lobster battling a giant white yeti, and from there it’s Nazi spies, the hint of cannibals in the sewers, ancient Chinese legends, a villain familiar to readers of B.P.R.D., a thug with a giant mechanical lobster claw, monstrous serpents and a foe Lobster thought he’d already dispatched to a well-deserved fate. Ranged against this there’s Lobster’s gang of sturdy battlers and resolute investigators. At issue is a power suit developed by a Professor Gallaragas. Lab assistant Jim Sacks escaped with it when the professor’s laboratory was raided and he was abducted along with his beautiful daughter. This is thrill a minute pulp reels on the comic page with an infinite budget, starring a driven man of few words and deep-rooted brutal violent tendencies. 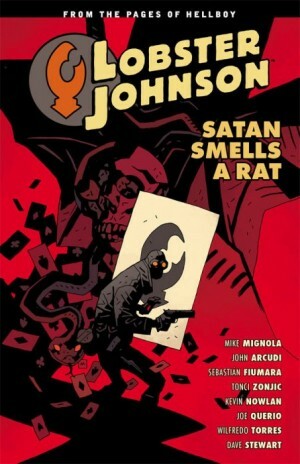 Mignola keeps rolling out the threats and maintains the story on the correct side of the fine line separating rollicking fun from recycled cliché. This wouldn’t be possible without a sympathetic artist, and Jason Armstrong takes his cue from the work of Guy Davis, responsible for much of the design, but delivers his own kinetic style. Much of the appeal of the art is due to Dave Stewart’s superlative colour work, which achieves mood with a very limited palette, predominantly shades of blue. 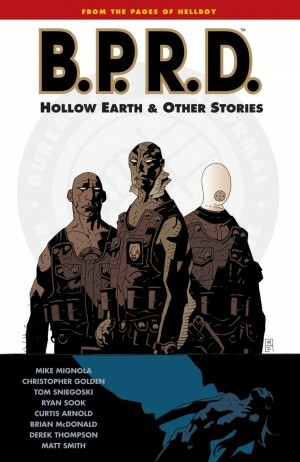 Readers of B.P.R.D. will find some background information to threats that appeared in the Plague of Frogs arc, and there are some amusing articles detailing Lobster’s history in pulps, comics and films. The other bonus material is several pages of Davis’ detailed designs and Armstrong’s embellishments. The enjoyment continues in The Burning Hand.